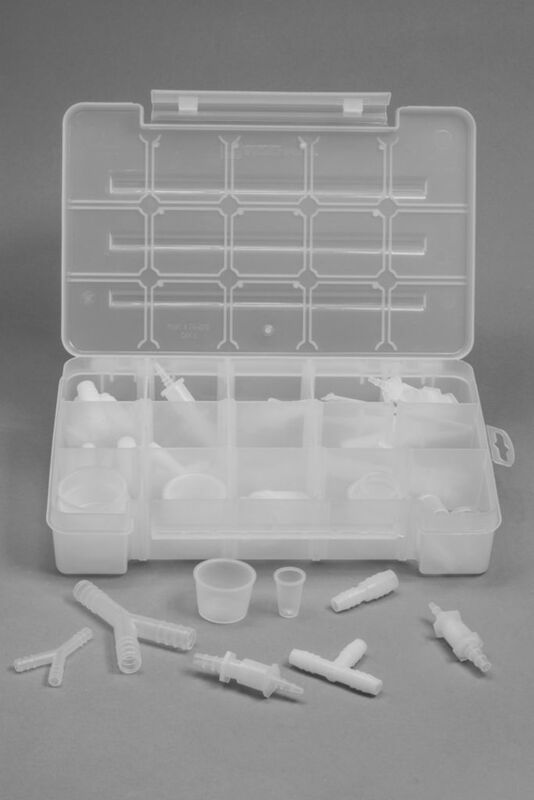 This generous assortment of 72 plastic fittings has everything you need for routine laboratory set-ups. 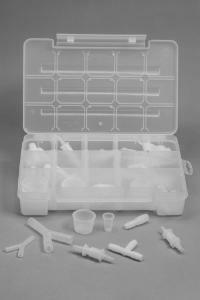 A clear, hinge-top, polystyrene storage box makes it easy to find what you need when you need it. The kit includes common sizes of connector and stopper styles. Certifications: Polypropylene fittings are FDA-graded for direct contact with food, drugs, and cosmetics and are autoclavable. Ordering information: This assortment includes polypropylene connectors: 5 pairs of straight tubing connectors and 4 pairs of T connectors. It has three polyethylene connectors: 3 pairs of quick disconnects, 6 pairs of straight-stepped tubing connectors, and 6 pairs of y connectors. It has 12 pairs of cup-type, polyethylene stoppers.